The Senate is pushing back its vote to kill the Affordable Care Act, Senate Majority Leader Mitch McConnell announced Saturday night, in order to wait until Republican Senator John McCain has recovered from surgery to remove a blood clot over his eye. 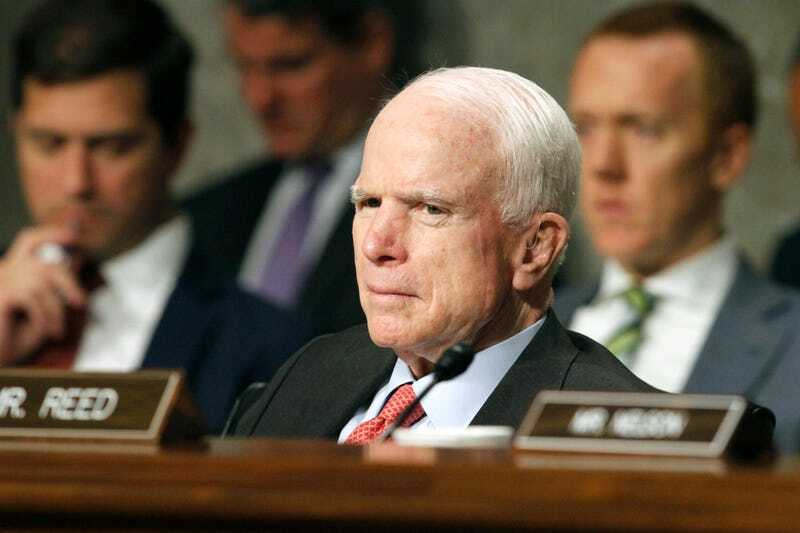 On Meet the Press on Sunday, Senate Majority Whip John Cornyn said that the motion to bring the bill to the floor will go forward just as soon as McCain can stuff himself back into his suit. In order to proceed, the bill will require the support of 50 out of 52 GOP senators. “We all wish John McCain a speedy recovery, and we need him in more ways than one,” Cornyn said. “Yes, I believe as soon as we have a full contingent of senators, we’ll have that vote.” The vote was originally supposed to take place before the July 4 recess, but was delayed when it became obvious it didn’t have the support to pass. Asked what it says about the bill that simply getting it to the floor is contentious enough to depend on one senator, Cornyn responded that, “Health care is hard, and we know that. But we have no choice but to try to come to the rescue of the millions of people who are being failed as a result of the problems of Obamacare,” he said. “This bill actually I think has gotten much better as a result of the discussions we’ve had amongst ourselves, and I think it’s something that once we agree to that we can sell to the American people as a better choice than the failures of Obamacare,” he added. Rather telling that Cornyn frames the discussion not on the merits of the bill itself, but as a matter of successfully selling it to the American people. Even he’s not trying to fool anybody. Two Republican senators—Susan Collins of Maine and Rand Paul of Kentucky— have already said they will not support the motion that would move the bill to the floor. Still others—including Senators Shelley Moore Capito of West Virginia, Dean Heller of Nevada, Lisa Murkowski of Alaska and Rob Portman of Ohio—have expressed concern about the legislation in its current form. The Mayo Clinic Hospital in Phoenix released a statement Saturday assuring...well, Cornyn, mostly...that McCain’s surgery was without incident. “The Senator is resting comfortably at home and is in good condition. His Mayo Clinic doctors report that the surgery went very well and he is in good spirits,” it said. “Have no doubt: Congress must replace Obamacare, which has hit Arizonans with some of the highest premium increases in the nation and left 14 of Arizona’s 15 counties with only one provider option on the exchanges this year. If I were McCain, I’d stay put in that hospital as long as possible.